Top off your engine with an Edelbrock high flow series air cleaner. 14” Diameter with breathable top washable 3” element. Fits 5 1/8” neck carburettors e.g. Edelbrock Performer Series, Holley. This air cleaner features a recessed base and so will sit lower over the carburettor giving an approximate installed height of 68mm. 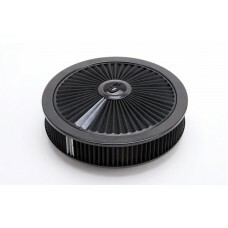 For our lowest air cleaner use MRG4339.